With the team of innovative craftsmen, we are engaged in providing the superior quality of Beautiful Mother of Pearl Wall Slab that is processed using the latest technology. We always try to develop something new in our products that will create a benchmark in flooring industry. We offer these products in the most affordable price. Quality of the products is checked by our expert quality controller before they are supplied to our clients. • Golden Mother of Pearl, Amethyst, White and Rose Quartz, Petrified Wood, Golden Tiger Eye, Blue Tiger Eye etc. • Size : 36 x 24, 48 x 24, 60 x 30, 60 x 36, 72 x 36, 72 x 48, 84 x 48, 96 x 48" Inch and any customize size as per requirement. With the team of innovative craftsmen, we are engaged in providing the superior quality of Lapis Lazuli Slab that is processed using the latest technology. We always try to develop something new in our products that will create a benchmark in Slab and Table Top industry. Our products are unique from the other backlit available in market. We offer these products in the most affordable price. Quality of the products is checked by our expert quality controller before they are supplied to our clients. 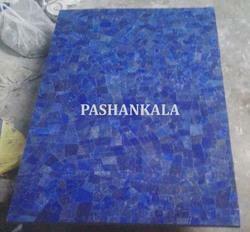 For the people who want to design their interior unique from others, we are providing the fine quality of Malachite Stone Flooring Slab that is processed under the guidance of our expert supervisors. These products have smooth texture but they are not slippery. These products have various natural shades that bring natural feeling to our clients. With the large distribution network, we ensure the on time delivery of the products. We assure the superior quality of products. These Blue Agate Stone Slab are available in different dimension with us and are known for their quality, like durability, longevity and reliability in term of usage. Being a leading manufacturer, we are engaged in processing the fine quality of Tiger Eye Slabs that is processed by sophisticated technology. Our products are very beautiful and are applicable in the flooring of office, houses, restaurants and farmhouses. This pattern to flooring gives the new look to the interior and enhance their beauty. Quality of the products is always checked by our expert teams before they are supplied to our clients thus we ensure the defect free products. 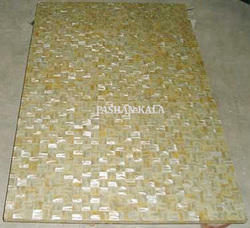 •Size : 36 x 24, 48 x 24, 60 x 30, 60 x 36, 72 x 36, 72 x 48, 84 x 48, 96 x 48" Inch and any customize size as per requirement. •Utilization : Home decoration, Kitchen, Floor, Bathroom, Hotel, Bungalows etc. With the team of innovative craftsmen, we are engaged in providing the superior quality of Lapis Lazuli Flooring Slab that is processed using the latest technology. We always try to develop something new in our products that will create a benchmark in Slab and Table Top industry. Our products are unique from the other backlit available in market. We offer these products in the most affordable price. Quality of the products is checked by our expert quality controller before they are supplied to our clients. To provide better Slab Top solution to our clients, we are offering the superior quality of White Mother of Pearl Kitchen Slabs that is processed from the premium quality of raw materials. Colors are very intelligently used in these products which enhance their beauty and make them more attractive. We are offering these products in various sizes to fulfill all the requirements of our clients. Our products are offered in the most competitive price. Quality of the products is checked by our expert quality analyzer. 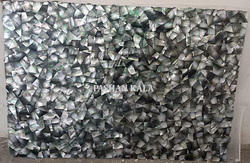 With the intelligent use of various attractive shades, we are engaged in processing the premium quality of Mother of Pearl Slabs that is processed using the superior quality of marbles. Products pass through stringent tests before they are supplied to our clients thus we offer defect free products to our clients. Our products are so beautiful and attractive that you don’t want to remove your eyes from them. These products are available in the market leading price. 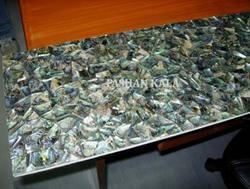 We are the prominent manufacturer , exporter, wholesaler & supplier of an exclusive range Black Mother of Pearl Slab. Our offered slabs are crafted utilizing high grade material and advanced technology to meet the set international quality standards. In order to cater varied demands of clients, the offered raw materials can also be customized in different designs and sizes. To ensure that only flawless products are dispatched from our end, our range is rigorously tested on various quality parameters. 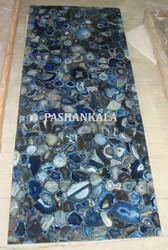 • Stone Name : Blue Agate, Yellow Agate, Natural Agate, Lapis Lazuli, White Mother of Pearl,. 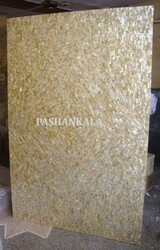 Looking for Semi Precious Stone Slabs ?